This original LiterMeter dosing pump has been in continuous use for over 7 years. The only maintenance that’s been required was to replace the tubing two years ago. It’s pictured here on the side of the author’s 42 gallon hexagon aquarium. It can run dry for an indefinite period of time. With some limitation, it can pump a slurry, such as a milky solution of kalkwasser, without fear of clogging. It is self-priming, and can lift a fluid from a reservoir. The fluid is confined to the tubing and does not contact the pumping mechanism or the air, which is especially advantageous when that fluid is a corrosive or caustic one, such as kalkwasser, which has a pH of approximately 12. The design of peristaltic pumps precludes the need for check valves, which are part of many dosing pump systems and invariably fail. The rotor mechanism is the only moving part and it’s maintenance-free. It’s energy efficient. For example, the LiterMeter consumes less than 3 watts of electricity in its running mode! It’s relatively quiet and can be used in a living room or bedroom setting. Having used all the dosing pumps for general sale in the aquarium marketplace, and many of the hospital-surplus peristaltic pumps re-sold in the aquarium market, I’ve concluded that the current Spectrapure LiterMeter III is the most reliable and best-designed dosing pump available to aquarists. I suspect that part of the reason is because it was designed from the ground up to work with aquarium applications and not adapted for aquarium use. 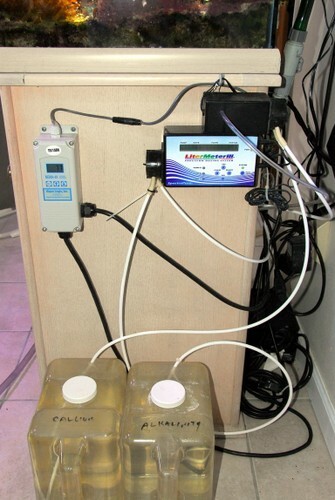 This is a close-up of the newer LiterMeter III dosing system that’s been in use for three years on the author’s 38 gallon reef aquarium. It’s been maintenance and trouble-free during the entire time. I especially like the fact that it can independently control up to three pump heads. This makes it ideal for dosing two-part calcium/alkalinity supplements or doing automatic water changes. The LiterMeter III offers an option that will turn the pump off when the water level in the sump or aquarium reaches a pre-determined level. Even though the total daily output is fixed once it has been set, this is an important safeguard and eliminates the need to fine-tune the output continually. The latest LiterMeter III can be set to dose as little as 50 milliliters to as much as 100 liters (~25 gallons) over a 24 hour period. It’s capable of lifting liquids 25 feet and pumping to a height of 60 feet! Calibrating the pump is very simple too: Press the calibration button to start the pump; press it again after measuring 500 ml of effluent. Once each pump is calibrated, all you have to do is set the total amount you want to dose each day. 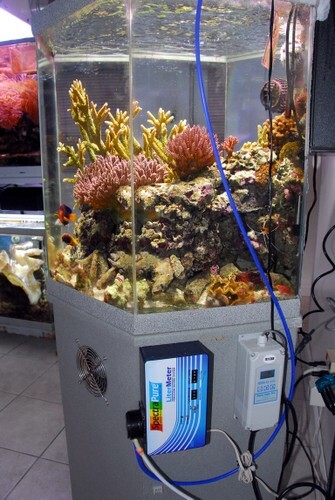 The LiterMeter III with optional second dosing pump is used to dose a two-part calcium/alkalinity supplement into the author’s 38 gallon reef setup. It’s proven to be very accurate and reliable in three years of use. The 2.5 gallon twin reservoirs are refilled weekly. The only maintenance is to periodically replace a small piece of tubing. I’ve replaced the tubing once in seven years of use on the original LiterMeter, and I’ve yet to replace it after three years of continuously using the LiterMeter III. I’ve also not experienced any technical or quality issues with either pump during that time. That’s outstanding reliability. And I’ve been told that the latest LiterMeter III utilizes a new and improved all-aluminum motor drive for enhanced reliability and quieter performance. 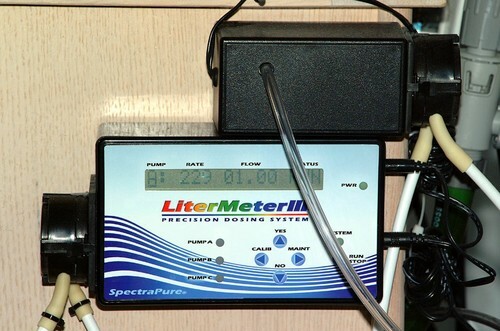 You can find more info on the LiterMeter III dosing system, including online sources for purchase, at www.spectrapure.com. 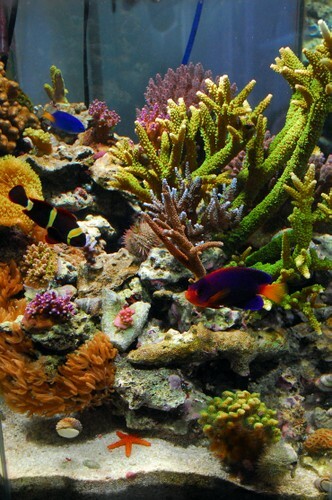 I don’t write about lighting products often because I don’t have the tools necessary to perform sophisticated measurements, but there are many factors to consider other than PAR value when purchasing a light fixture to hang over a reef aquarium: Aesthetics, value, longevity, efficiency, and perhaps the most important criteria of all, the growth and coloration of the living creatures in the aquarium itself. This last criterion can only be discerned by hanging the fixture over a living reef aquarium for an extended period of time and observing the results. 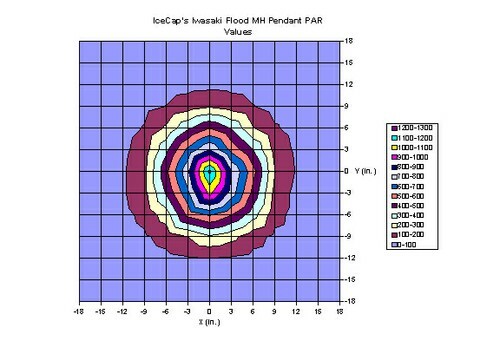 When I last wrote about the IceCap stainless steel pendant that features a metal halide flood lamp, I had been using it for approximately 12 months. Well it’s now been 24 months with the same lamp and I remain equally impressed. In fact, my 42 hex aquarium has now become my frag grow-out tank because I get the fastest growth and best coloration of SPS corals in this aquarium. 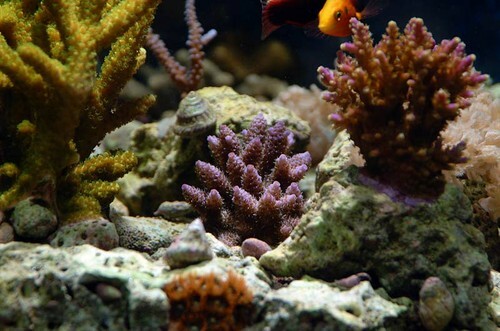 Pictured is a fragment of a purple colored Acropora millepora in the author’s 42 gallon hexagon aquarium shortly after installing the IceCap pendant. Pictured is the same purple Acropora millepora now grown to a full-sized colony two years later in the author’s 42 hex aquarium. 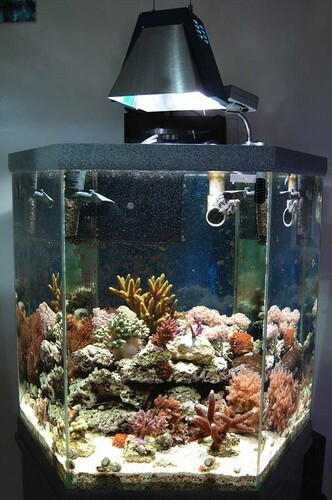 This is a picture of the author’s 42 hex reef aquarium shortly after installing the IceCap pendant fixture. As a recap from my previous review, the pendant housing is constructed of heavy brushed stainless steel. It’s infinitely adjustable vertically by pulling and pushing on the steel hanging wires. The fixture has held up well in 24 months of use. Any discoloration of the steel is easily brushed away and the powder-coated parts show no evidence of peeling or corrosion. As I explained in my previous review, the fixture itself simply functions as a housing for the bulb, which is the real story here. 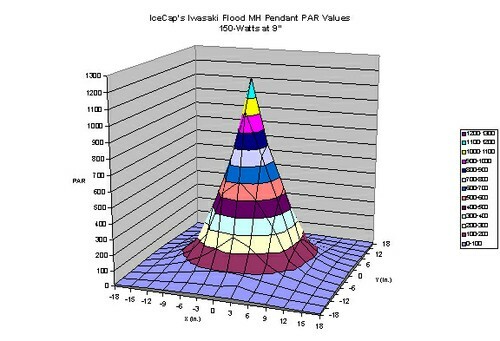 Iwasaki managed to squeeze a 150 watt double-ended metal-halide bulb into a PAR36 flood lamp. Furthermore, the reflector is built into the lamp! It’s a very efficient design as all the light is directed straight down and there’s no loss of light outside the aquarium. When combined with the IceCap 150 watt electronic ballast, it makes a highly effective and efficient combination that rivals most 250 watt setups in terms of light output. These new Iwasaki metal halide flood lamps come in 70 and 150 watt versions, blue and daylight (6500K) color temperatures, and PAR36 and PAR38 configurations. 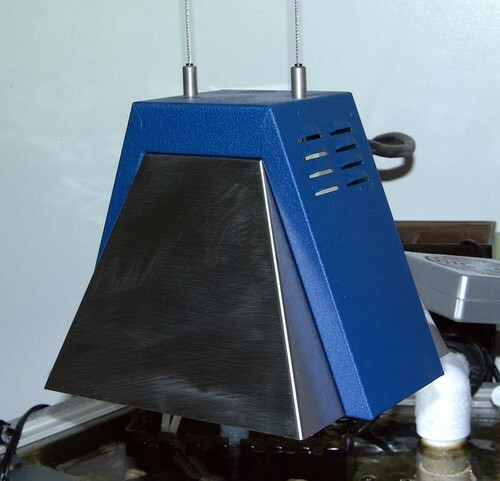 After experimenting with the various bulbs, I’ve concluded that the 150 watt 6500K PAR36 flood lamp (M150P36FD/MED-R 6500K 150W Flood) is the best design for use over a reef aquarium. The Iwasaki literature states that the color temperature of this lamp is 6500K and the CRI is 96. It appears bright white over the aquarium and doesn’t require supplemental lighting, unless you’re a blue freak. I’ve been told that a 10K version of the lamp is being developed, and I’m looking forward to that. 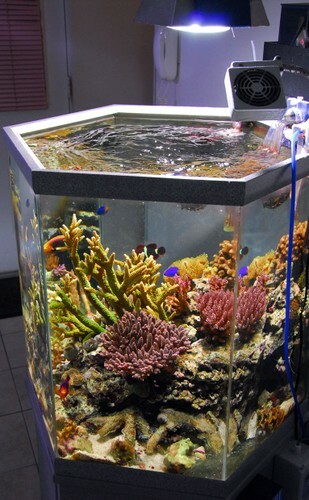 The same 42 hex reef aquarium at a later date shows great color and growth of the SPS corals with the IceCap pendant and Iwasaki lamp. 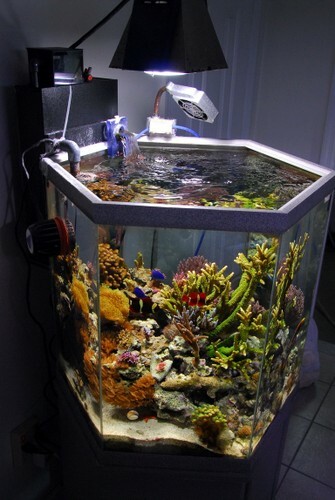 This is a current view of the IceCap pendant over the author’s 42 gallon hexagon aquarium after two years of use. The IceCap pendant is constructed of heavy brushed stainless steel and powder-coated blue paint. It’s vertically adjustable by a simple pull and push of the steel hanging wires. I should add that the IceCap150 watt electronic ballast that’s powering this lamp is now 3 years old. It continues to perform very well and I would never go back to the standard magnetic core and coil ballast of yore. I’m able to mount this tiny (fits in the palm of your hand) IceCap ballast inside my aquarium stand with no concern for noise or heat. It’s a major improvement over the cinder-block sized ballast that I used previously. That one got hot enough to fry an egg! 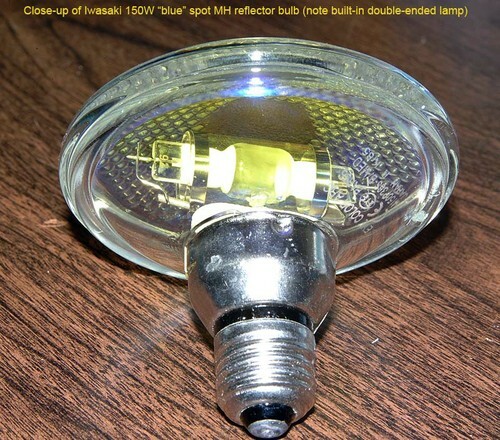 This picture of an Iwasaki metal halide flood lamp clearly shows the built-in 150 watt double ended bulb. 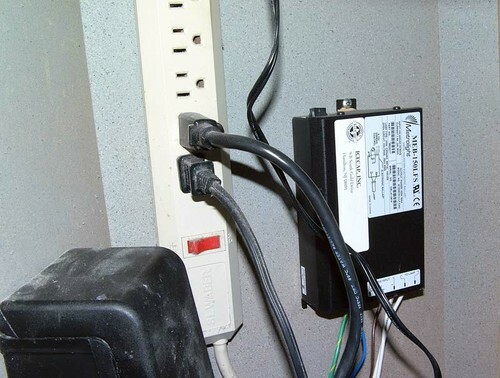 The IceCap 150 watt electronic ballast that drives the pendant fixture is small, lightweight and runs cool, which enables the author to mount it inside the aquarium stand. You can find out more about the 150 watt lamps and electronic ballasts at the IceCap website at http://icecapinc.com. The fixtures and lamps are on sale through Drs. Foster and Smith at www.drsfosterandsmith.com.